Eishundo (栄春堂) is a Shogi Piece, Japanese Style Chess, shop located in Tendo Yamagata. It has all kinds of Shogi pieces from reasonable class to the highest class. 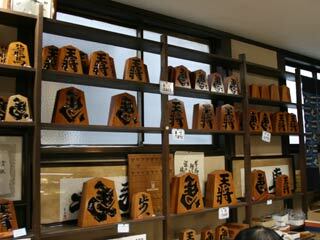 All of the Shogi Pieces in Eishundo are hand made by the traditional way. The work area is opened to see, therefore the customers are able to see the masters' works. It has also Kokeshi Dolls and all kinds of Shogi related items. There is a parking on back side. Eishundo makes your original garnish of Shogi Pieces with your name on it. Not only the garnish, but for a small key chains, or straps, too. 4 ranks of Shogi Pieces. 1. Kaki Goma - a drawing fonts with lacquer on the pieces. 2. Hori Goma - a carving fonts and colored with lacquer in the carve. 3. Horiume Goma - a lacquer marquetry font with fill of lacquer in the carve. 4. Moriage Goma - a mounded by drawing over Horiume Goma. Teach you to draw your words on Shogi pieces. Make your original Shogi pieces. Products: 9cm pieces and 6cm pieces. Teach you to draw face and design on Kokeshi Doll. Make your original Kokeshi Doll.